Allow employees to clock from their workstation. Restrict web clocking based on IP address. 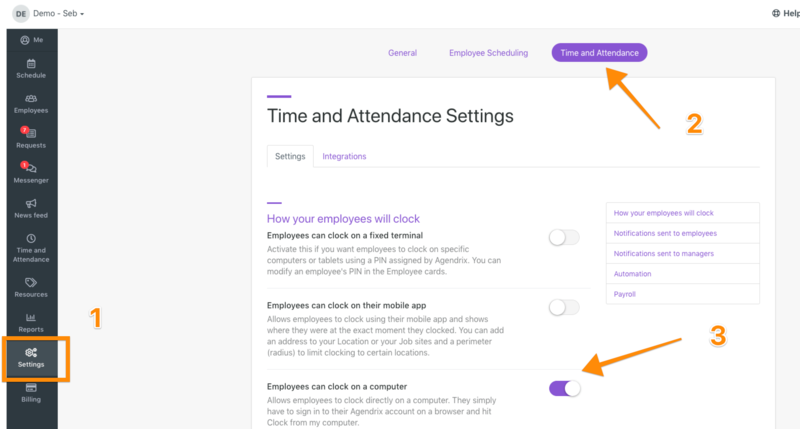 If your employees use computers at work you can allow them to clock directly from their Agendrix account online. You can additionally restrict this capacity only to certain networks based on IP addresses. See how it will look from an employee perspective. Enable "Clocking from a computer"
Once you save, the system will give you the option to restrict to certain networks or not. You can restrict the ability to clock from the web app based on IP address by click on "Yes". If you click "No" employees will be able to clock from any network. It is possible to change this later. There is a quick step to authorized your current network. You can add more networks later. At all times an admin can manage (Add or remove) authorized networks from the "Time and attendance" menu ➡️ "Manage authorized networks"
If you have restricted clocking from the web app to certain networks, you will be able to track when employees clock from an unauthorized network using the clock log (accessible under "Manage authorized networks") . You will then know if some networks need to be added!